As an ex-rasta I came to Islam with a little bit of knowledge of herbal medicine, having read books like”Back to Eden ” by Jethro Kloss, a Quaker herbalist and put what I learnt into practice. This knowledge has been further enhanced by my study of the Medicine of the Prophet. I am currently studying Clinical Nutrition mashalah. The ratio for concoction is 1 teaspoon with 1 cup of hot water, leave 5 minutes , strain and pour into cup, add honey. You can make more and leave to go cold and strain and place in bottle to gargle sore throat. it is known by herbalist and singers as one of the best herbs for the throat. Sage Is An Outstanding Memory Enhancer. Salvia officinalis (garden sage, common sage)in Arabic its called mariyama, is a small, perennial, evergreen subshrub, with woody stems, grayish leaves, and blue to purplish flowers. It is a member of the family Lamiaceae and is native to the Mediterranean region, though it has naturalized in many places throughout the world. It has a long history of medicinal and culinary use, and in modern times as an ornamental garden plant. The common name “sage” is also used for a number of related and unrelated species. Salvia and “sage” are derived from the Latin salvere (to save), referring to the healing properties long attributed to the various Salvia species.It has been recommended at one time or another for virtually every ailment by various herbals. Modern evidence shows possible uses as an antisweating agent, antibiotic, antifungal, astringent, antispasmodic, estrogenic, hypoglycemic, and tonic. In a double blind, randomized and placebo-controlled trial, sage was found to be effective in the management of mild to moderate Alzheimer’s disease. 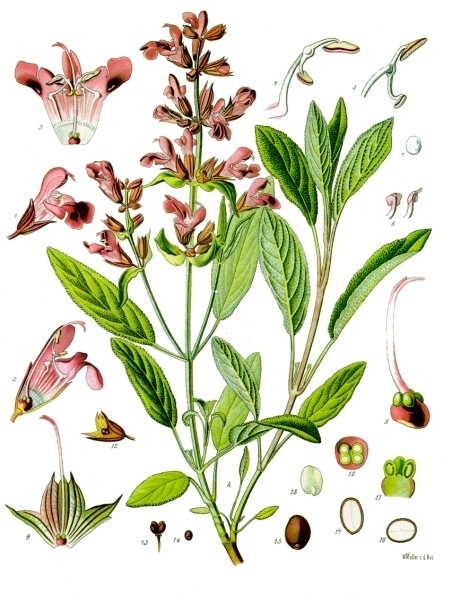 The strongest active constituents of sage are within its essential oil, which contains cineole, borneol, and thujone. Sage leaf contains tannic acid, oleic acid, ursonic acid, ursolic acid, cornsole, cornsolic acid, fumaric acid, chlorogenic acid, caffeic acid, niacin, nicotinamide, flavones,flavonoid glycosides, and estrogenic substances. Investigations have taken place into using sage as a treatment for Alzheimer’s disease patients. Sage leaf extract may be effective and safe in the treatment of hyperlipidemia. ^ a b “Sage”. OBeWise Nutriceutica. Applied Health. Retrieved 2008-02-04. ^ Akhondzadeh S, Noroozian M, Mohammadi M, Ohadinia S, Jamshidi AH, Khani M. (2003). “Salvia officinalis extract in the treatment of patients with mild to moderate Alzheimer’s disease: a double blind, randomized and placebo-controlled trial”. J Clin Pharm Ther 28Journal of clinical pharmacy and therapeutics 28 (1): 53–9. doi:10.1046/j.1365-2710.2003.00463.x. PMID 12605619. ^ Akhondzadeh, S; Noroozian, M; Mohammadi, M; Ohadinia, S; Jamshidi, Ah; Khani, M (February 2003). “Salvia officinalis extract in the treatment of patients with mild to moderate Alzheimer’s disease: a double blind, randomized and placebo-controlled trial”. Journal of clinical pharmacy and therapeutics 28 (1): 53–9. doi:10.1046/j.1365-2710.2003.00463.x.ISSN 0269-4727. PMID 12605619. Antioxidants are the primary source of the health benefits of sage. Like rosemary, another member of the mint family, sage contains a variety of antioxidants — in the form of volatile oils, flavonoids and phenolic acids.Sage also contains antioxidant enzymes, including superoxide dismutase (SOD ) and peroxidase. When combined, these components of sage all give it a unique capacity for providing benefits associated with the top antioxidant foods. Sage contains rosmarinic acid, which is a potent antioxidant as well as anti-inflammatory agent. Rosmarinic acid can be readily absorbed and acts to reduce harmful inflammation. Increased intake of sage as a seasoning in food is recommended for persons with inflammatory conditions like rheumatoid arthritis, as well as bronchial asthma and atherosclerosis. Research confirms what herbalists have long known: sage is an outstanding memory enhancer. Sage helps provide better brain function and has been used in the treatment of cerebrovascular disease for over a thousand years. Research has suggested that it may be an effective option to help treat Alzheimer`s disease. The benefits of sage are effective for symptoms of menopause, night sweats and hot flashes. There`s also compelling evidence that sage may provide benefits for some people with diabetes by its ability to boost insulin`s action. this s great. I was talking with 3 amazing islamic women at the and one mentioned she gets headaches. I told her that I would find the name of an Islamic holistic herbal place. here in UK, I had seen on the net. But do you have something meanwhile? Her headaches were in her forehead region?